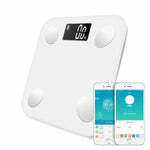 If all you expect to get out of your scale is a daily update on your weight, you are drastically underestimating this simple bathroom fixture. This Step-on Digital Smart Scale can measure everything from your body mass index to your bone mass and more improved features. This bathroom scale could be the central tool to help you reach your fitness goals. 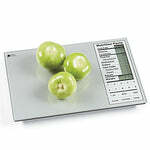 Multiple people can use the same scale, making them perfect for a health-conscious family. A smart scale helps a family organize their health initiatives because it makes the tracking effortless. Adding a smart scale to your own or your family's weight-management plan could help give everyone the boost they need to get those daily weigh-ins done. Developing positive daily habits is hard, but it's a little easier when you have a new device to play with while doing it. 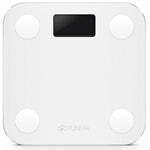 Multi-functional: Provides accurate body weight measurement and tracks body fat, total body water, muscle mass, bone mass, and kcal. Combined with BIA technology, which incorporates a person’s age, height, gender, and weight, for its accurate measurements. Step-on technology: It automatically powers on upon contact and features 3 touch sensitive buttons for easy operation. Automatically turns off to conserve battery power, low battery indication, and overload indication. 10 users memory storage: A Built-in memory for up to 10 users with auto recognition technology for shared use at home, the office or the gym, etc. So you only need one scale for your whole household. Accurate measurements: Utilizes 4 latest generation high precision sensors to capture weights up to 400 lb (180 kilograms) in 0.2 lb or 0.1 kilograms increments. Three weight units:kg/lbs/st. Large, easy-to-read, bright backlit LCD screen: Displays all results on its extra-large, backlit LCD screen, easy to read even in dark. Fashion concise style. Safety and comfort - 6mm thick tempered glass and non-slip, scratch-resistant feet pad that provides exceptional sturdiness.